We are beginning kindergarten with two of my kiddos and are busy organizing life for school. I’d love to tell you I have our learning routine or system together… but I don’t! This past week, I scoured the internet in search of tips to help us as we adapt to a life of learning with kiddos in preschool and kindergarten. Here are a few of the “must-do-one-day” tips I have found. A Little Delightful has a great printable to help you plan lunch boxes. No more eating PB&J three days in a row! I Heart Organizing has a great snack system. In her fridge she keeps a basket full of snacks for lunches and for after-school treats. DownTown created a list of tons of great, healthy snacks. We are on the go a lot more during the school year and snack more often. So many great suggestions to tide us over. Or keep all the snacks organized together in the fridge or pantry. I just love this idea from Blooming Homestead. A Bowl Full of Lemons keeps their school snacks and lunch items separate in the pantry. Here Comes The Sun uses a hanging clothes organizer to prepare school outfits — use one shelf for each day of the week. If your kids are learning to read, use large letters to label your school clothes organizer, like Better Homes and Gardens. 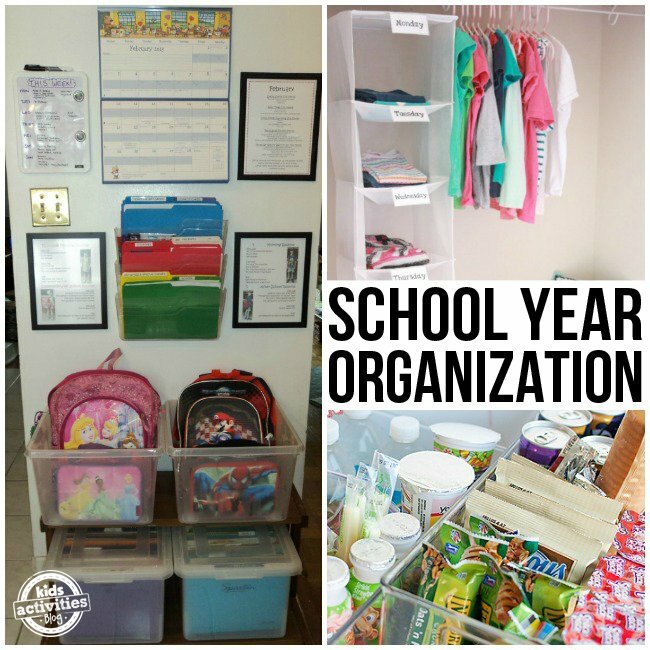 The Organised Housewife created an organized school supply station with a place to hang backpacks. And school supplies always begin with a backpack and lunch box. We have a few favorites including this Megapak backpack & Lunch Cooler Combo! Use a file box to keep papers from school organized, like From Overwhelmed To Organized. Does your preschooler come home with hundreds of papers, projects and artworks? Mine do! I love this “binder plan” from MondoCherry. Organizing our preschool really means organizing my life — use a household notebook to keep things in order. We have a craft closet that is exploding – and I love this idea from I Can Teach My Child. She uses a hanging clear shoe holder to organize supplies. No more hunting for colored chalk! …and lastly my favorite! 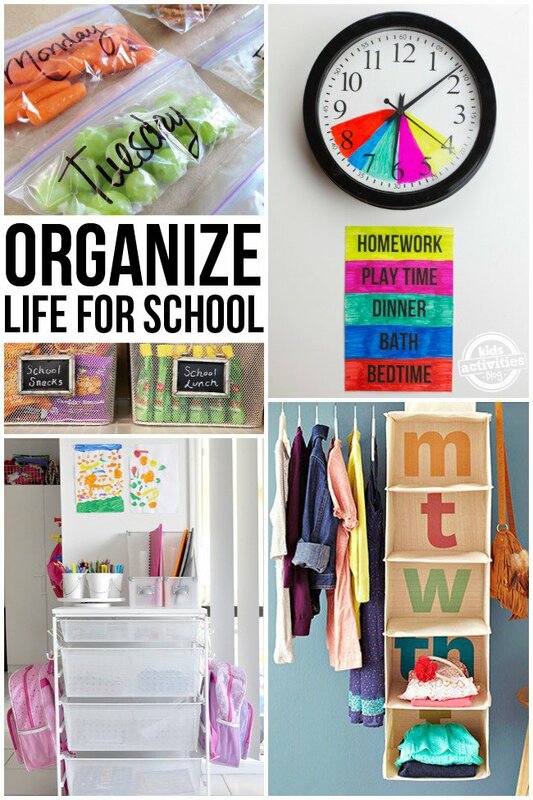 Organize your “school” closet with these simple tips! And don’t forget using the space under your child’s bed to organize any items that don’t fit in the closet. You’ll love these Monster Under the Bed Storage containers! What advice do you have for moms prepping for preschool? Previous Post: « Tulsa Cat ‘Steals’ Money To Give To The Homeless!